Ray Ladbury @146 — In the strict sense of proof, a hypothesis can only be proven false via deduction from some prior axioms. A hypothesis can be demonstrated to be false in this universe by an appropriate experiment, but that is not a proof sensu stricto. Could you write a bit more about what you mean by information theoretic methods? These are recent enough that many here on Real Climate would probably appreciate a short description. I did some numerical experimenting myself, result and octave code. It is simply not true that ‘screening’ selects for hockey stick like proxies. 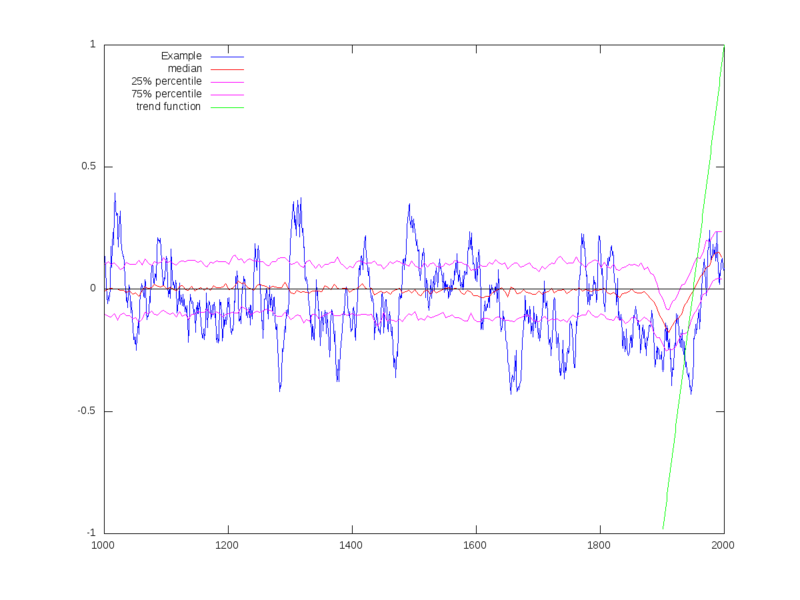 Yes, it selects for proxies having the same trend as that screened against (artificial trend line in green, 1900-2000), and the effect of this propagates back to about 1850 due to the assumed autocorrelation; but before that the proxies are unaffected. They are exactly the same as without the trend screening, centering on zero. There is no ‘screening bias’ or ‘screening fallacy’. Note that in my figure the ‘stick’ of the hockey stick points to the middle of the ‘blade’, i.e., it’s more like a bishop’s staff! Not at all like in real reconstructions (like Gergis et al. Figure 4 on page 49 — or actually, all serious hockey sticks since the dawn of time (like, MBH98/99), where the pre-instrumental temperatures average well below the mean of the instrumental period, which is precisely the point. Gavin said above “despite personally feeling bad after making a mistake, fixing errors is a big part of making progress”; well said indeed. But Lotharsson in linking to a recent attack on me by Tim Lambert at Deltoid, which picked up on Tamino’s pointing out an error in my recent paper in TSWJ(also noted here) did not mention that I (1) admitted the error and then (2) explained why I was in error, because I overlooked that the independent variable in my Table 1(radiative forccing by the aggregate of all GHGs) was unlikely to be autocorrelated, as for example CH4 and CO2 are not correlated See Table 2.1 in AR4 WG1). Tamino did not find I repeated my error in the many other regressions I reported in my paper and its SI. More generally, why is it that the expert econometricians here and at Lambert’s and Tamino’s never themselves undertake and report regressions rejecting the nul that increases in GHGs since 1958 do NOT explain temperature anomalies? “Evidence of unusual late 20th century warming from an Australasian temperature reconstruction spanning the last millennium”. That is its total absence of any proxy records for mainland Australia, as shown in its Fig.1. A more modest title would have been appropriate and would have attracted less attention. Further to Susan’s mention of the DotEarth mention of McM, what struck me about Revkin’s piece was his generalization about the improving effects of “blog review” on science, while failing to note that this “blog review” activity is confined nearly if not completely exclusively to those provinces of investigation that collide with revenue streams and other worldly matters not having to do with science. Scientific progress is pretty much an accidental effect of “blog review,” rather like being “saved” from driving over a cliff by crashing into a telephone pole. By information theoretic methods, I mean the methods that allow comparison of models and characterization of the efficiency of models in accommodating new information/data. Hirotsugo Akaike’s Information Criterion was the first entry in this regard–for although AIC is looked on by most as a useful tool, it is actually an unbiased estimator of the Kullback-Liebler divergence (which can be viewed as an expectation of the logarithmic divergence between two distributions) between the “real” distribution and the model being examined. Similar quantities approach the problem from a Bayesian viewpoint(e.g. BIC/SIC) or from a more general viewpoint (DIC). All of these quantities are useful for comparing predictive power of statistical models, but what do they mean? As it turns out, you can look at the behaviors of quantities like AIC as measuring not just the goodness of fit of the model, but also how sharply the data define the parameters of the model. A further step in this direction–which I haven’t seen applied too much yet–is information geometry, in which spaces defined by the parameters of a model have a metric defined by the Fisher Information matrix. This is a very elegant approach, and has some interesting features when you look at different models–e.g. the fact that the exponential distribution is a limiting case of both the Weibull and the Beta distribution means that the parameter spaces of these distributions coincide along a line in their spaces. I’ve used this somewhat in my own research–though I haven’t explicitly used the information geometric point of view as nobody in my field would understand it. As I noted on that Deltoid thread, Tim Curtin has entirely missed the point of my reference to that thread. There is nothing unintentional about the escalating and rather successful effort to derail scientific communication and scientific progress. We are moving from the naming of RealClimate, Mann et al. as charlatans and traitors to actual threats of violence, and I find it disturbing, to put it mildly. Inasmuch as Andy appears to be unable to do as much science as I can in reviewing these claims, and that’s not much, he should acknowledge that he does not know what he does not know, and stop stoking the fires of ignorance and hatred. This is not a high school social and merit is merit. That’s why I persist in a discussion here that is largely above my head (though I still work hard and read almost all of it), in the hope that there is some way to penetrate the fog before it’s way too late. #159–In a way, the disgusting developments you rightly deplore, Susan, are encouraging: the famous dictum Isaac Asimov put in the mouth of Salvor Hardin, that “Violence is the last refuge of the incompetent,” is fairly intuitive. Most of us know that the loudness of one’s shouts is not correlated positively with the soundness of one’s knowledge–and that in fact the need to scream often screams most loudly of intellectual impotence. One hopes at least that the recent over-reach of the Heartland Institute will prove to be something of a pattern–or a deterrent. Susan: Inasmuch as Andy appears to be unable to do as much science as I can in reviewing these claims, and that’s not much, he should acknowledge that he does not know what he does not know, and stop stoking the fires of ignorance and hatred. Or at least ponder on the meaning of the word “promoter.” Revkin’s not the only journalist who seems to fall prey to the role of being a bucket on a conveyor belt raising what is low to a higher level. Serving as Steve McIntyre’s volunteer editor to clean up his blog review speech habits and pass McIntyre’s opinions upward after being stripped of revealing context is a form of promotion. In post #133, I asked if you can point out any specific examples of data which had a correlation in the range of p=.05 to .10? As I understand it, the p value is the probability of obtaining a test statistic at least as extreme as the one that was actually observed. So obtaining one result with p value of .1 out of, say, 10 tree rings (10%) could hardly be considered remarkable. Or obtaining around 100 correlations out of 1000 with p=.1 could not be considered remarkable. I would argue that in those cases, a p=.1 could easily be attributable to random noise. So my rephrased question is: Can you point to any specific examples where data shows much greater than 10% percentage of the tree rings samples matched temperatures with a correlation of p=.1 or better? I had hoped that Andy would take as a caveat the fact that Heartland considered him to be sympathetic. It appears that instead he is rushing obliviously on into a status worthy of parody on Comedy Central. To rise weakly to his defense, I really think Andy desperately wants to believe in the bona fides of all players in the so-called “climate debate”. However, to persist in such a belief in the face of the behavior exhibited by the denialati betrays a naivete so extreme that I just want to reach out and comfort him by inviting him to a p-o-ker game. I feel like I’m getting pedantic here, but this is an important point about the semantics of effectively communicating the realities of AGW to the general public. As I understand it, you are arguing that it’s wrong to say that anthropogenic warming has been “proved” — and indeed, wrong to ask whether it’s been “proved” — because, as you wrote earlier, “outside of mathematics (and deductive logic) there are no proofs”. So it’s interesting that you use the phrase “beyond a reasonable doubt” in suggesting an alternative way of asserting anthropogenic causation — since “beyond a reasonable doubt” is the standard of proof required of the prosecution in a criminal trial. As it happens, I’ve served on a jury in a criminal trial. When the judge instructed the jury before we went to deliberate, he very clearly and carefully stated that the standard of proof (his word) required for a conviction was “beyond a reasonable doubt” — and explicitly distinguished that from proof “to a mathematical certainty” (his exact words). In effect, he told us “the word ‘proof’ has multiple meanings, and this is the meaning that applies here”. So, I think your very use of the phrase “beyond a reasonable doubt” serves to point out that there are other “formal” uses of the word “proof” that are different from the use of that word in mathematics and logic, and that in context are entirely legitimate, appropriate, and well-understood. When scientists are asked “Has it been proved that humanity’s emissions of CO2 are causing the Earth to heat up?” they have two choices. They can launch into a lecture about how the one and only “correct” use of the word “proved” is the way it’s used in formal mathematics, and that outside of that context nothing can ever be “proved”. Which is both counterproductive as it leaves the questioner confused and doubtful about the reality of anthropogenic causation, and a semantic fallacy since there are, in fact, other legitimate, formal and well-understood meanings of the word “proof” — in law, for example. Or, they can recognize that the questioner is using the word “proved” in something much closer to its legal sense than its mathematical sense — that the questioner is a juror and not a mathematician — and simply answer, “Yes, it has been proved beyond a reasonable doubt”. As to “…some way to penetrate the fog before it’s way too late” I can only suggest a re-examination of the roles played by deniers and clueless “promoters” (very apt) and how they end up shaping the conversation to either contain or destroy opposition. Distraction, screening, intimidating, bluffing, and perhaps more than anything else wasting time, ends up defining what takes place for those trapped in the denier arena –out of all proportion to actual numbers or scientific acumen. And always, always, always ask who exactly is your audience? Take it to them. Okay, so you are answering and not blocking. Good. My mistake for making assumption and I retract calling you cowards. Answer to your question, I have looked and have not been able to find and study with local data to compare against. My question was genuine. Here are some screening stats from Mann et al 2008. It’s also worth noting that Mann et al produced EIV reconstructions with both screened and full proxy sets, with similar results. The full table is here in the SI. You’re right, I overstated: a bad unhelpful habit. Promoting, or just giving a pass and cleaning up is not stoking fires, though the end effect is the same. The framers of the hate talk make it an almost irresistible force. Since the planet is an immovable object there are fireworks ahead. Andy’s desire to find good in people permits advantage taking. I think many indulge in wishful thinking when they assume it’s meant well; people are to be prevented from thinking for themselves. Looking beyond to the real audience, this seems to point to make as often as possible, that people can and must think for themselves. Ray Ladbury @156 — Clear. Thank you. SecularAnimist @163 — On the other hand, scientists require unambigously defined terms (to the greatest possible extent). I realize not all follow the high standards which the mathematicians must maintain, but increasingly that is (uniformly) so. Thereby for STEM folk, scientists, technicians, engineers and mathematicians (but also philosophers), proof has only one meaning, that as used in deductive logic. I fully realize that it has other meanings in other settings including jurisprudence and potable alcohol testing. But climatology is a STEM subject, one which being science has to make do with less that certainty in matching observations and measurements to calculations from models. However that may be I see nothing wrong with a answer of beyond a reasonable doubt which almost all will understand correctly. Going only by my own. One of the aspects of science that I think it is hard for laymen to appreciate is the fact that the truth doesn’t lie in the middle. Even scientific consensus is not so much an “averageing” effect as it is an assessment of what theories/viewpoints are making most rapid progress. Truth is where the evidence points. This makes science different from other disciplines–like journalism or theology–that at least purport to seek truth. They try to find balance between extremes. Science tries to minimize entropy. If you add a teaspoon of wine to a gallon of sewage, you get sewage. If you add a teaspoon of sewage to a gallon of wine, you get sewage. Thanks Ray. Time for me to brush up on those laws. I am not your typical layperson, I’m afraid, as it would be nice if most laypeople gave science its proper value. It took a lot of hard work for me to know as little as I do, but understanding how science works is deeply embedded in my life. Dad continues to produce physics, and we wonder if he will be alive by the time it is recognized, or if he is suffering from emeritusitis. He recently attended a meeting about new developments with cold atoms and such and said it was just like his early work, only different (ot, maundering on as usual). I think I knew your father when I was an editor at Physics Today. Physics gets a lot tougher to do as one gets older. Ray, for me yes. For him, not so much. I think he finds it hard not to do physics. Time for me to shut up and let everyone talk about the topic, I think. I’m wondering. Dendrocronology work aimed at temperature reconstruction sometimes picks places where temperature change has a stronger effect than say drought on tree ring growth in order to get a clearer signal. When I read about the ice bore hole results here, I thought, well, you can constrain earlier temperatures to some extent since NYC would not be built where it is if it had been much warmer than now for very long (say 300 years) owing to induced sea level rise. But that is not very high temporal resolution. So, I wonder if, just as a dendrochronologist might choose and forest edge to gain sensitivity, a glaciologist might use ice on different slopes to set an upper limit on past temperature by saying this or that configuration could not have survived any warming similar to the present for three decades or six etc. Combined with the age of the ice, some fairly robust limits might be worked out for a region perhaps. Thanks for the link. The coldest summer in the past 1500 years was 1904, which appears to match the glacial extent of the LIA. The warmest summers were centered around 1000, which showed both higher and prolonged warmth compared to the recent century. Of particular note is the increased sensitivity of the growth to temperature in the past two centuries. While no explanation could be given for this change, could it be the combined effect of increasing temperatures and atmospheric CO2 concentrations? Glacial maximums during the LIA difference considerably over different global regions. While the glacial maximum from the LIA is generally given as mid to late 19th century (earlier in places like Alaska), Norway experienced a second maximum around and after 1900. > definition of the term. I’m guessing Gavin means “summer” — redefined in this thesis for this location explicitly. This is not the summer you were thinking of. Dan H. uses several terms in his sentence, besides the one unattributed quotation he takes out of context without quotes. The rest is his usual. It seems this author had to redefine “summer” to get the thesis result. That’s reasonable, I suppose, to document a small local area with unique conditions. Perhaps it’s why this didn’t get published, as it’s not directly comparable to other work? Oh, heck, I meant to give up on Dan H.
I think you added another 0 to 50 years from the mid 19th century to 1900. An event like the LIA, which lasted several centuries, could very easily have local ending times which vary by 50 years (not 500). Actually reading the report would shed some light on these definitions, insteading of guessing. The fuss made me look for a definition or explanation of ” screening fallacy”. There were three things usefull on the first 6 google pages; then the topic ran out. One piece by a stats guy explained things to me. The interesting thing is that the ” fallacy” only exists at CA. Other climate parrot sites repeat McIntyre’s stuff ( incoherent to me) and the Blackboard has a couple of attempts. My conclusion is that the “fallacy” doesn’t exist. It’s just made up by McI . He seems to be saying that if you check data for relevance you’re cheating but if you don’t check data you’re a fraud. I just wasted a couple of hours. Thanks Steve. >Actually reading the report would shed some light on these definitions, insteading of guessing. Oh the irony! Thank you Gavin for the service you (and other RC contributors) provide those actually wishing to learn and discuss the science in an honest fashion. I lack your ability to stay focused in the face of this kind of nonsense. I have learned a lot in the past 2 years here — not just about climate science, but about the relationship of science and society as well. That doesn’t make it incorrect. Glaciers in much of the Arctic on Baffin Island, Western Greenland and Bylot island had their LIA maximum dates between 1880 and 1910… If you need references I can provide – My work is reconstructing former glacier advances during the LIA. One would think that this late advance probably has something to do with the significant impact of Krakatau and Novrupta on Temperature’s along the North Atlantic basin during this time period. Can you explain why the longer record was not ‘examined’? The original study was supposed to be 2000 years but apparently somewhere it was chopped in half. How/why did that happen? And when did your ‘model simulation’ for comparison with this palaeoclimate reconstructions begin? Before or after they decided to only examine the past 1000 years as compared to the past 2000 years? And does their reanalysis of the data have any affect on your model simulations? Eric #187, perhaps the more generic subject of easily misunderstood jargon. My favourite nit is the use of “orbital” and “sub-orbital” by climatologists for time periods corresponding to, or shorter than, Milankovich periods. In fact, changes in the Earth orbit are only one contributing factor in this; the orientation of the Earth’s axis of rotation being actually more important. Lost in all the discussion about the ending of the LIA is the question of why tree rings have been more sensitivy to temperature recently. Does anyone have any other thoughts besides higher CO2 concentrations? I doubt there is a need to say this, but I’m a skeptic, or denier, or whatever you want to call me. Ignorant, stupid, whatever. Am I correct in understanding that the effects of C02 are so well understood, that many, some, most, hold that without change, massive warming will occur, change the planetary climate system, etc.? Given the climate system is so well understood, then shouldn’t the cooling agents, such as Sulfur compounds, also be understood to a certainty? And if they are, why aren’t those who think C02 is such a danger offering up the cheap alternative of injecting sulfur compounds into the atmosphere? In other words, help me to understand if C02 is going to cause these problems, and yet curtailing C02 emissions would be so incredibly difficult, and the climate system is so well understood, why are there no advocates of Sulfur compounds? [Response:There ARE advocates for sulfur compounds. Bizarrely, many of them are “skeptics”, which contradicts the logic you very reasonably lay out. Don’t ask me why — ask Bjorn Lomborg. There are at least two fundamental differences between CO2 and sulfur in this context. First, CO2 (being a gas) is well mixed through the atmosphere, and so we can know to very high accuracy how much there will be at any location as long as how much we know there is on average. Second, CO2 is CO2 is CO2 — it’s radiative properties in the lab are the same as anywhere else. The “sulfur” you refer to is really sulfate, which is a solid, and a hygroscopic solid besides. SO2 gas is emitted to the atmosphere but it quickly becomes oxidized to sulfate (SO4(2-)) before it has a chance to become well mixed. So it’s not uniformly distributed, which means its global radiative properties can’t be known (for example, lots of sulfate over Antarctic during winter (where there is no sunlight) will have no effect). And sulfate in the lab isn’t sulfate in the atmosphere. Sulfate particles can be various sizes, and they can have various compositions (since it isn’t just sulfate in the aerosol – it’s sulfate and water and organic nitrogen compounds and …etc.). So it’s radiative properties cannot be known very precisely in the real atmosphere just from lab measurements. Now, some experts on aerosol radiative properties will tell you we know all this well enough to start pumping SO2 into the atmosphere. Note that this can’t just be done once – it has to be done continuously because the darned stuff keeps glomming onto water and falling out as (acid) rain. Most (all?) of us at RC think this is a silly idea, despite that fact that, yes, the CO2 part is very very certain.